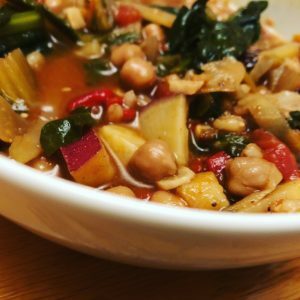 There are many versions of Moroccan chili, and my twist on this delicious soup is one of my coziest wintertime favorites. Once I perfected my version this winter, I made it literally three times in a row, and too many times to count since! I never get tired of it and it’s great for sharing. The secret to this spicy and slightly sweet soup is the spice. (Wow, that was a lot of alliteration.) Ras El-Hanout is a traditional Moroccan spice mix. You can buy it, but making your own is easy and you’re likely to have all the ingredients. If you know me at all, you know I almost never can leave a recipe alone, so I put my own stamp on this recipe for Ras El-Hanout by doubling the cumin and ginger, and using a full teaspoon of pumpkin pie spice instead of the allspice and cloves. I also add in 1/2 tsp of white pepper! In my variation, the farro gives it a chewy meaty texture (even though it’s all plant-based); veggie “ground” crumbles or tofu boost the protein and density as well. As usual, it’s all one pot and it’s really easy. It’s also 100% plant-based and I always use organically produced ingredients. In a large heavy-bottomed soup pot or Dutch oven, sauté the onion and garlic in the a bit of broth (and a smidgen of avocado oil if you desire) until onion is translucent. Add a little more broth each time you add another veggie (potato, carrot, cabbage, then zucchini) and allow to soften. Add spices/seasoning and rest of broth. Add tomatoes and beans. Bring to a boil, then simmer covered until sweet potatoes are soft. Put the greens in for the last ten minutes or so. Serve with raisins sprinkled on top. You can vary this soup in lots of ways. I’ve alternated between using Beyond Meat “beefy crumbles,” Hodo Soy Moroccan Tofu Cubes, and even an Field Roast Apple Sage “sausage” for extra protein boost, or you can leave that out entirely also (or add more beans). At times I’ve added cauliflower (about 2 cups) instead of the zucchini, and when i was out of the traditional raisins I used unsweetened dried cherries, which were actually amazing. Also, you can substitute barley for the farro (or leave it out entirely to make it gluten-free), and it’s just as good. Finally, there are many Moroccan lentil stews, and you can substitute 1.5-2 cups cooked red or green lentils for the garbanzos! Enjoy this satisfying crowd-pleaser any time! ROBYN LANDIS is an ACE-certified holistic health coach, fitness trainer, fitness nutrition specialist, behavior change specialist, bestselling author and herbalist who likes to call herself a “joyful nourishment instigator.” A 25-year veteran of the fitness industry who vibrantly walks her talk, she believes that we can evolve how we think about healthy living to make it a natural, joyful choice. She has helped thousands overcome health-info overwhelm, and crack the code of “motivation.” She weaves nearly three decades of study and practice into a signature blend of science, spirit, and common sense—refreshingly free of hype, regimens, and extremes. Robyn’s books (including Herbal Defense, cowritten with one of the world’s top plant-medicine experts) are published in five languages with a combined 200,000 copies in print, and her third is on the way. She coaches and trains privately and in groups, helping people love getting the body and energy that’s fit for their purpose, and grow “chronologically richer” fearlessly and beautifully. Her clients learn to integrate food, exercise, rest, meditation and traditional healing, and become deeply happy getting exceptionally healthy™ —with energy to spare and the health to thrive and live fully. She also speaks and writes passionately about how we can transform medicine and fitness culture to inspire people to be good to themselves—which is what self-care really is.